Description: Right after the trio of SD60Ms cleared, another pair of them comes through on the Z-STPCHC! This time it is the 8194 leading 8179. Description: S LBACHI1-10 With BNSF 7735, CN 5415, CN 5702, BNSF 8179, & BNSF 4562 with 84 Loads, 7639 Tons 7879 Feet. Photographed at 15:11. Description: The BRC enters the North Reciever with the sun shining brightly on the downtown skyline. Seconds later this train would go into emergency because of a partial seperation of an air hose. Description: An all SD60 consist heads East. Description: An all SD60 consist heads East after allowing a doublestacker to pass it in the siding. Description: Posing with the city's water tower. Description: An all SD60 consist heads East. I later found out they stopped to set out a bad order car in town. 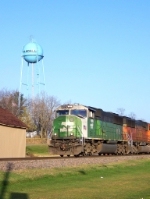 Title: BNSF 8179 in the bunch with a CN engine! Description: Could be 2010 or just after the merger! Description: BNSF SD60M's #8117 and #8179, the power on an EB tie train, are parked at Coffeyton, MO, for the weekend. They are part of the MOW operation replacing ties along the Cuba sub. Description: The BN/KCS Mixed freight heads toward Selkirk. Description: Q38105 stops at CP-373 in Rochester to inspect a suspected overhanging trash load about 20 cars back. BNSF 8134, BNSF 8179, KCS 4703 for power. Description: BNSF ex.BN SD60M 8179 trails on Q201 South. Description: This trio has been running on the M-KCKEMP for a while now, and this is the second time I've shot it. Come on BNSF, keep this rolling! Description: BNSF SD60M 8179 is one of 24 locomotives in storage at Newton on the BNSF La Junta Subdivision due to traffic levels. Units stored at Newton on this date are: C44-9Ws 608, 613, 614, 617, 620, 622, 624, 625, 629, 630, 633, 634, 636, 637, 641, and 642; C40-8Ws 897, 925, and 934; SD60Ms 8164, 8176, 8179. and 8196; and SD75M 8268. Title: BNSF 633 and 8179 and 8176 sit silent.